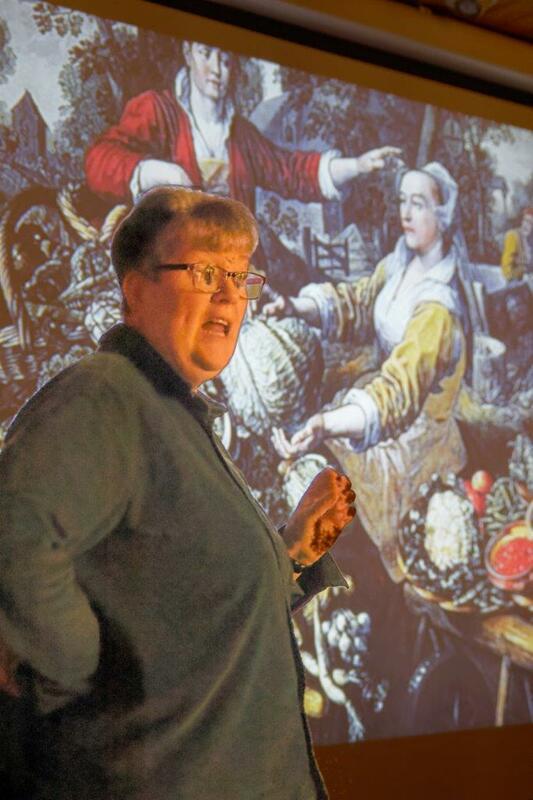 The January meeting featured Sarah Gathercole, who demonstrated using slides, how fruit and vegetables were often portrayed in paintings throughout the ages. Sarah drew the meetings attention to the various styles used. These paintings captured the culture of society of the day and were reflective of the time in which they were placed. Notes on Symbolism in Art for Fruit and Vegetables through out the ages, with links to the artists. Grapes Grapes represent fertility and salvation in their symbolic link to the blood of Christ, but also are symbolic of the dangers of debauchery. Lemons Linked in Christian tradition to fidelity and, therefore, to the figure of the Virgin. Lemon was often an imported fruit, thus suggesting wealth and luxury. Apple A symbol of salvation and truth, as well as fecundity. Pomegranate Pomegranates feature heavily in Judaism and are used in religious memorials to signify heavenly sweetness, or fertility. The fruit, broken or bursting open, is a symbol of the fullness of Jesus’ suffering and resurrection. Fig Strong biblical associations, as the fig tree is the third tree to be mentioned in the Bible. The fig has strong connotations with modesty and sexuality, as Adam and Eve covered themselves with fig leaves.